The most frequently used style guide for software documentation. Replaces the Microsoft Manual of Style and is now free of charge. Here you can request a free copy of the ASD-STE100 Specifcation. This document contains many good writing tips and rules that can be applied to any project. Complete, downloadable style guide in PDF format (approx. 200 pages). To find the guide on the web site, enter “publications style guide” into the search box. Style guide from the manufacturer of the easyDITA content management system. Comprehensive style guide for documentation and user interface text. Can also be downloaded as a PDF (approx. 110 pages). Addresses some general topics, such as writing for a global audience, plus language, grammar, punctuation, and various writing conventions. Writing style guide specifically for writing software documentation. Style guides for documentation and texts within the user interface. Brief guide with some basic tips. Brief style guide for writing wiki entries. Comprehensive style guide, published by the Institute of Electrical and Electronics Engineers’ Computer Society. Detailed guide to the preferred National Geographic Society style. Comprehensive style guide and textbook on online information design in general. List of frequently abused and overblown words and their plain English equivalents (PDF, 19 pages). Go to the “Publications” section. Collection of handouts and exercises on general writing concerns, grammar, spelling, punctuation, and professional writing. Collection of free guides in PDF format. Collection of resources that are aimed to help you write more clearly and more concisely. Gives away two free booklets in PDF format: “Writing Styleguide and Dictionary of Plain English” and “Sharpening Your Writing Skills—A Workshop for Business and Technical Writers.” For the download, go to the “Publications” section. Brief reference of proofreader’s marks. 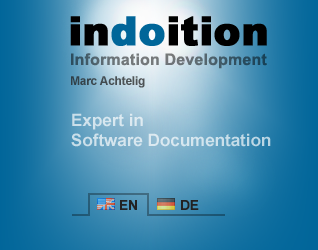 I can give you expert advice and individual training on creating and optimizing technical documentation, especially software documentation. I can create top-quality user manuals, online help, software videos, and all other forms of software user assistance for you.